QUESTION: Where Can I Find Industry-Standard KPIs? Probably at least half of the people who join Measure Up are in search of the same thing as Alessandro: off-the-shelf, ready-made KPIs for their business or their clients. It’s an innocent search, but it’s an insidious search. Quite innocently, you’re trying to save time and effort, and set up some KPIs quickly. But you’re in grave danger. These are signs that there is no ownership, no buy-in. 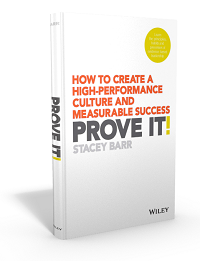 People won’t buy in to KPIs unless and until they are a part of the process to choose them! Consultation is not enough, by a long shot. 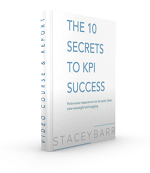 It’s the conversation to find and choose the KPIs that makes all the difference. Through that conversation, people find a meaning in their work they didn’t know existed. They find a higher purpose for coming to work; they find greater leverage to pursue excellence in their work; they find passion and they feel excited. Handing a team a ready-to-go dashboard will tickle their fancy for a few days. Until the silly dials and gauges bore them. But working hand-in-hand with that team to explore their purpose, their priorities and their points of highest leverage will excite them for months. Making this kind of thinking a routine part of how they work will keep them excited forever. TAKE ACTION: Rather than continue down the path of pushing KPIs at people, learn how to engage them – REALLY engage them – in finding their own KPIs that powerfully focus them on truly making a valued impact through their work. You can do it here. Working in a public sector setting I often face a similar challenge. We have many performance indicators which we are assessed on. I work with improvement projects to define measures and create the supporting analysis with project teams. Sometimes these projects will have an explicit objective of improving performance on an existing measure. But often that won’t need to be their core objective as they are, or perhaps should be, working on more intermediate outcomes on the way perhaps to those overall performance measures. Or they are legitimately working towards something that goes beyond the core set of external measures. But many projects assume they have, or want to focus on existing measures because they are “official”, rather than working out exactly what they should be measuring. Official? What makes a measure official? In this case, by “official” I mean a measure which comes from an accountability process e.g. it is a measure that we are assessed on by external stake holders (commissioners, the public, the next level in a hierarchy of organisations, the government.). Sometimes they have associated targets we are supposed to hit. In other cases we are assessed as to how we compare to others. And in common with many public organisations probably, we face a lot of these. They are important, they just might not be the ones best used to assess the performance of a particular process or project.